Ron's response: Models of Excellence in the classroom. Read his comments in Education Week here. His full response is below. We spend a lot of time in education thinking about how to teach, but not so much time thinking about how people learn. I believe that most of us—adults and children—learn much of what we know through models. If there is one practice that is under-utilized in classrooms, it is a lack of strong models that provide students a vision of what they are aiming for. We need to analyze models with our students to understand what quality looks like in a particular domain or format, and we need to help our students chart a path to reach the quality that good models represent. This is a simple idea that does not go over well much of the time. As teachers, we worry, understandably: “What if students copy those models?” We have been taught since we were young that copying is cheating, and if we provide good models for students, they will inevitably start copying. We tend to forget that much of what we learn, perhaps most of what we learn, we actually learn through copying. Let’s say we, as adults, wanted to learn something new—perhaps woodworking, or guitar, or Spanish, or tennis, or writing code to create a website. We would start with models, and we would use models throughout our learning process. We would look at well-crafted furniture to learn what we can copy, and we would also try to copy techniques with tools. We would listen to guitar music to learn technique, and we would also carefully watch someone play. We would listen to Spanish being spoken by a native speaker. We would watch videos of tennis professionals, or watch a friend model tennis strokes for us in person. We would study well-written computer code to understand how and why it works. We would copy everything we could copy in our quest to get better. And we would seek ongoing critique from peers and experts: are we copying this correctly; are we doing this well? Eventually we would begin to improvise and make our technique more our own. But we would always start by copying. One thing we would not do is attend a class with a teacher who refused to show us models of what we are trying to learn. But this is what often happens for our students. Every day in school we ask students to create things: to write persuasive essays or history papers, to explain the mathematical thinking involved in solving a complex problem. We tell students what we expect from them in terms of quality; we name features of quality in that genre and sometimes we give them a rubric of how they will be assessed. Those are all good supports. But students have no picture in their minds of what excellence looks like. As teachers, we have that picture, but students can’t read our minds. If students have never read and analyzed great persuasive essays, no rubric or list can give them the inspiration and guidance to get there. We need to bring models into the classroom. The first step in this practice is for teachers to build a library of models of what quality looks like in the format they are asking students to use. Those can be models from the professional world (e.g., high school science students reading professional journal articles; ELA students reading professional book reviews). Even more powerful is to provide students with models created by other students so they can see that students their age can do work of great quality. Because we as teachers tend to give similar assignments every year, a good practice is to save the best work every year (with student permission and names redacted) for possible future use as models. My colleagues at EL Education and Harvard Graduate School of Education and I have created a collection of free, open source models of high-quality student work, housed on a website, Models of Excellence. We welcome you to download any models that are useful, and also to submit models of student work to the site from your own classrooms. Once you have strong models, we suggest leading critique lessons in which students view models to analyze what is working in them: what features of the work are high quality and what strategies the author of the work used to make it good. That analysis is different from typical critique—it is not in service of improving the work. Instead it is a search for only the positive dimensions of the work that we can learn from. From that analysis, the class can create criteria lists for quality in that genre, rubrics for assessment in that genre, and can choose features and strategies that students want to borrow and use themselves. I spend a good deal of time visiting classrooms around the country in which students are, to be blunt, doing low-quality work. For example, I recently walked into a middle school social studies classroom where students were creating posters describing ancient civilizations. The students were polite and earnest, but the work was awful. I wished I could have called “Time Out,” and pulled out high quality posters—professional posters from museums or great posters done by students—and started a conversation, right then, about what a quality poster looks like. The students deserved that clarity. 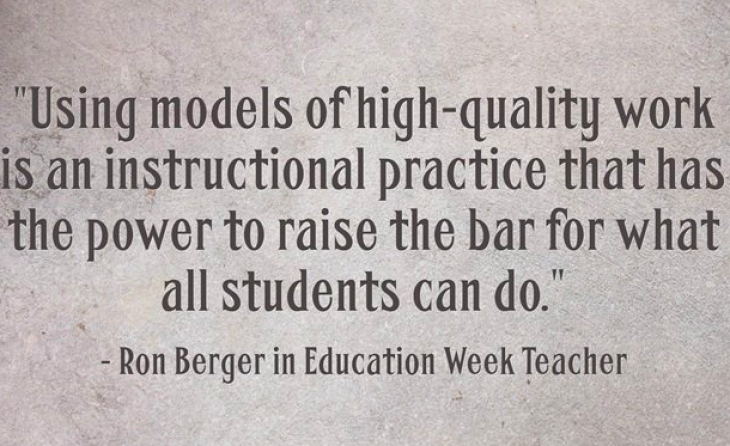 Using models of high-quality work is an instructional practice that has the power to raise the bar for what all students can do.